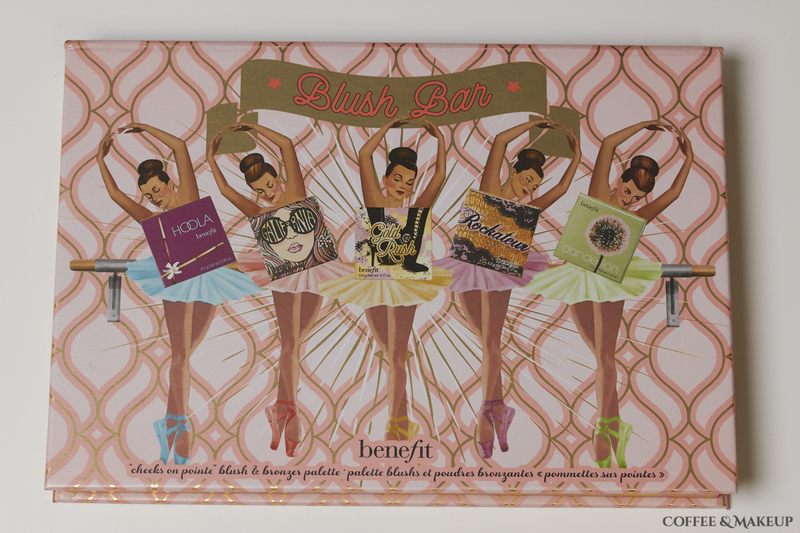 Benefit Blush Bar is a Cheek Palette containing 4 blushes and one bronzer, all full size. There is a small brush included and a mirror inside the lid. The lid closes shut with a magnet. It retails for $58 and is available to purchase from Benefit, Sephora and Ulta. Individual boxed powders retail for $29 whereas, in this palette, you are getting them for just under $12 each. The included brush has enough stiffness to blend shades out well. It’s not incredibly soft but it’s still comfortable against the skin. The two that I have full sizes of are pretty darn close to the ones in the palette. Dandelion in the palette is a tiny bit brighter in color and more powdery than the original. Rockateur is nearly identical though the palette one is a smidge more powdery and less pigmented. Galifornia in the palette is a different color and finish than the mini size I have. Hoola in the palette is much more pigmented and very easy to over apply. If anything I think the quality of the powders in the palette is better than the two minis I have, but slightly less quality than the original full sizes. Galifornia has a cool-toned medium pink base with a warm-toned peachy sheen. It is bright but not too pigmented so a brush picks up just the right amount of color. It applied evenly and blended well. There is a noticeable sheen when it is swatched but applied on the cheek, it imparts a barely-there satin glow that mostly looks like the natural finish of skin. It wasn’t powdery or dusty in the pan. It started fading after 5 hours of wear and was barely visible at 8 hours. Gold Rush is a warm-toned, pale, muted peach with a very subtle golden sheen. It was very sheer. I had to really load up my blush brush and apply a few layers to get it to show up on me. It applied evenly and blended out easily. This was a little bit powdery in the pan. I noticed light fading after 7 hours. Dandelion is a cool-toned, pale pink with a subtle golden sheen. This is supposed to be a brightening face powder but I use it as a blush. It’s a bit too dark for my complexion to use as a face powder. A brush picks up more product than Galifornia and Gold Rush but because the shade is pretty pale, it’s not an issue. The color applies evenly and blends out easily. This was somewhat powdery, more so than the original Dandelion I have in my collection. This started fading after 7 hours. Hoola is a very warm-toned medium-deep bronzer. It is also very pigmented and somewhat loosely pressed. My brush picks up a lot of product so I need to tap it on the back of my hand first to avoid over-applying. I have to work carefully with this one but it does apply evenly and blend out well. This is the most noticeably powdery shade in the palette. It lasted for 8 hours with very minimal fading. Rockateur is a peachy pink with a bluish-pink sheen and warm undertones. The base color of this looks very similar to Gold Rush but the sheen is different. It has semi-sheer pigmentation but it builds up easily. It applies evenly and blends out well. This faded after 8 hours.